Police officers line up to protect the LAPD headquarters Nov. 25, 2014, in Los Angeles as they face off with protesters after the grand jury decision not to indict Officer Darren Wilson, who shot dead unarmed teen Michael Brown in Ferguson, Mo. Los Angeles Mayor Eric Garcetti announced Tuesday that the city would purchase 7,000 body cameras for police officers, reports the Los Angeles Times. The introduction of body cameras is part of an effort to increase transparency. Body cameras have become a focus since the killing of Michael Brown by now-former Ferguson, Mo., Police Officer Darren Wilson. Garcetti told reporters in a news conference that body cameras "are not a panacea, but they are a critical part of the formula. They're a great step forward. The trust between a community and its police department can be eroded in a single moment. Trust is built on transparency." Police Commission President Steve Soboroff has spent a good portion of the year raising funds for cameras. Soboroff said that the Los Angeles Police Department program could set a precedent for police departments across the nation. "There are more and more advantages of having cameras than we've ever thought. 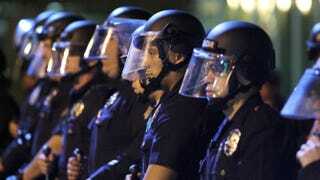 It's music to the ears of the LAPD and law enforcement and the community," he said.